Blogging can be tough work at times. You have to feel passionately enough about something to write nearly every day if you want to build and keep a good readership. Some people start blogs for personal reasons-- they want to document their lives, keep friends and family updated, or just post pictures of their kids. Others may be extremely knowledgeable about a certain subject and wish to share this knowledge with the world. And still others may start blogging because they are well-known by the public and wish to keep their fans updated. I'm talking specifically about the various Food Network celebs who've started and failed to maintain their blogs. When Dave Lieberman burst onto the Food Network as its youngest host ever it seemed only natural that he'd start a blog and capitalize upon his youth appeal. His Web site, www.davecooks.net, debuted quickly along with a promising interface containing news, photos, forums (that have since been shut down after being overwrought with Cialis spam), and a BLOG. Dave's blog section is literally YEARS overdue for an update. Perhaps Dave thought that the traditional written blog would be too much work, so he opted for both audio and video blogs. His audio blog section, containing ONE post, includes references to "regular updates" and that'd he'd "let us know what he's up to." Well, two years later he's only got that one post and a "coming very soon!" note on the video blog section. What gives, Dave?! You removed the forums section because it wasn't working. 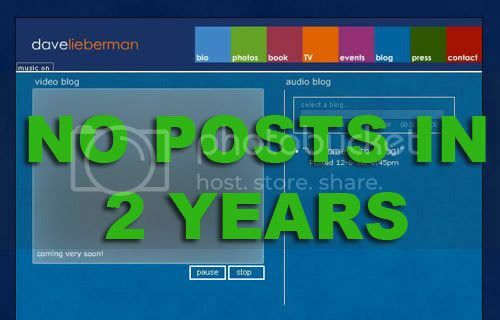 Do you still think this whole blogging thing might just randomly work out... two years later? I found out back in November that longtime Food Network star Bobby Flay also has a blog. 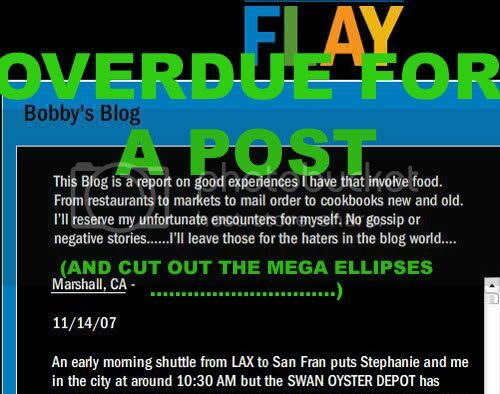 Despite promising to leave the gossip and negative stories to the "haters in the blog world," Bobby has pretty much failed to write (or let his assistant write) much of anything worth reading. Combine that with a horrible interface that only allows you to scroll through a tiny window and a ridiculous amount of ellipses (...) and things that only resemble ellipses (...............) and you get turned off rather quickly. Who else should be fined? Tyler Florence has been one of the best Food Network bloggers. His new blog hasn't been updated since Jan. 11, but I'll give him a break. He's also been the best about sharing relevant information and stories in his blog posts. You know-- stuff we might actually want to read. My buddies at Charm City Cakes (and stars of Ace of Cakes) debuted a blog a few months ago and have been pretty good about keeping updated. They are so busy, so I'll cut them some slack. Basically, my point is that if you've got a blog... then blog! To those Food Network stars who maybe weren't sure what they were getting into when they thought "Hey! I should start a blog," I say: either get it together, or just get rid of it. Bourdain just updated his blog today. At least Mary Alice has an excuse. The latest Charm City Cakes blog says she broke her arm! Blogging is also the powerful tool to increase traffic on your website. It is observed that if a blogger properly execute the procedure, traffic generation process can be speed up in very short period. Making your property ready for viewings is also important. Some say that brewing fresh coffee or baking bread in the kitchen is the best way of making an impression on people viewing the property, but nothing will stick in their minds more than a well-presented, well cared-for home. The much-vaunted 'kerb appeal' factor is very important in creating the right first impression and setting the tone of the viewing. Pets and clutter should both be banished for the duration of the viewing, and if possible and necessary, you may want to send the children and partner to the park for an hour while people are viewing the property.